What is Learning readiness? ILT explains the significance of this for school. All children can learn and their mental development, seen by the changes in ability that they show from infancy to adulthood, is due to their immense capacity for learning. The stage at which children are thought to be learning ready and so ready to benefit form formal or academic education, usually around the age of 6 or 7 years, is decided by normal mental and physical development. At around this age, they should have reached a stage of being ‘ready’ for school. The concept of ‘learning readiness’ includes the idea of ‘school readiness’ but the two terms are not identical in meaning. A child may pass a school readiness test but not be learning ready. It is because school readiness tests do not include the child’s level of neurodevelopment. This means that they don’t consider how the child’s brain and nervous system has developed and whether the child’s various sensory motor systems are functioning well enough to support learning. 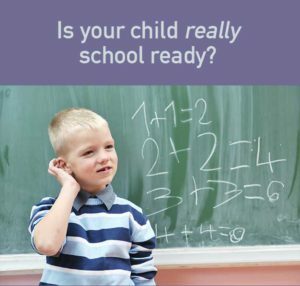 School readiness tests look for signs that certain abilities have developed that are needed to perform in the classroom. These include the ability to sit still and follow instructions, manipulate a pencil, get along with peers and show certain perceptual and intellectual skills. Perceptual skills include recognizing and being able to name colours, letters and numbers. Intellectual skills include knowing one’s home address, and so on. Many children show these abilities but the foundation of neurological systems on which these abilities rest is shaky, and they may start showing problems in school either within a short period of time or even after two or more years. Some children may seem to do well academically but their lack of learning readiness will mean that they have to use up a great deal more energy than should be necessary to cope with the behaviour and learning expected by their schools and communities. To summarise, in order to be able to learn easily and cope with the demands of the classroom and life in general, children need to have reached a level of brain and body development that will support their functioning. This will depend on how well they have developed certain systems in their brains and bodies that are needed to support their learning. A system can be described as a number of separate parts that work together in order to get something done. For example, a bicycle is a collection of items that are needed in order to provide transport. It needs a frame, saddle, handlebars, pedals, chain, wheels, tyres and brakes. If all those parts are in good working order, the bicycle will work well. Think of what would happen if one or more of these components are not working as well as they should. A tyre that is slightly flat will mean that one has to work a lot harder to get the bicycle to move quickly. It will place stress on the wheel itself, which might in turn affect the stability of the frame, the way the brakes work, and so on. In other words, the inefficient functioning of one of the parts of a system will have a ripple effect throughout the whole system. In the same way, every child has certain systems that support his or her ability to learn easily. These include the components of the sensory-motor system, such as vision, hearing, touch, smell, balance and sense of body in space. If one or more of these are not functioning as they should, the child will be handicapped in that learning becomes difficult and stressful and seemingly simple tasks cause tiredness and distress. Tendency to chew on collars and necklines, pencils and anything else! Any of these signs (and more) could be clues that the brain hasn’t developed as it should or that the sensory systems are immature. This in turn means that faulty foundations will affect higher level skills – those demanded by school. Simply put, the child is not yet learning ready. See an ILT practitioner click on the ‘Find a Practitioner’ for a full assessment of whether or not a child has developed to the point that he or she is really learning ready. If not, much can be done to help ‘catch up’.